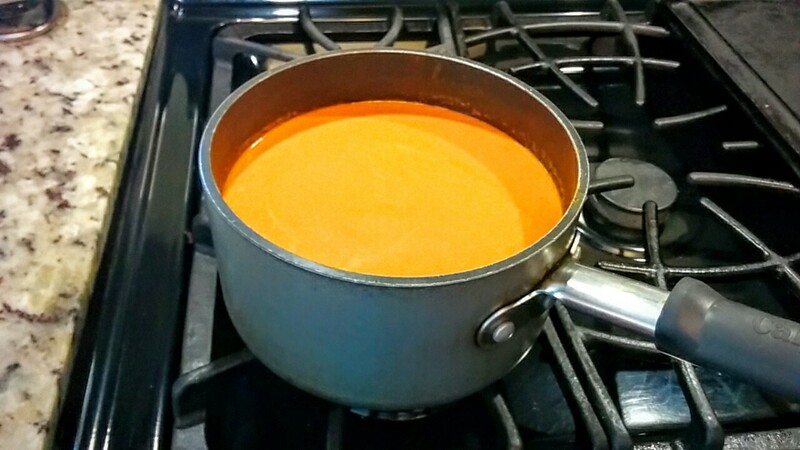 One of my favorite soups when I was growing up was Campbell's Tomato Soup. Add a grilled cheese sandwich on the side and you have the ultimate comfort food menu. Now make that grilled cheese sandwich on homemade sourdough bread, and it's just heaven. Many of the copycat recipes I found all called for tomato sauce and powdered ingredients. I wanted my version to be just a little richer, so I used diced tomatoes, fresh garlic and fresh onion. The results are the flavor of the original Campbell's, but just a little more intense. Place the first 7 ingredients into a medium sauce pan. Use an immersion blender to thoroughly mix the ingredients until you have a thick sauce. If you don't have an immersion blender, you can use a regular blender and then transfer the ingredients to the sauce pan. Use medium heat and bring the ingredients to a low simmer. Slowly add the cream and the milk and heat to a low simmer for about 10-15 minutes to make sure the onion and garlic are thoroughly cooked.